Last week was the start of something wonderful for me, clearly, as I began to put base coats on more Stormcast Eternals. 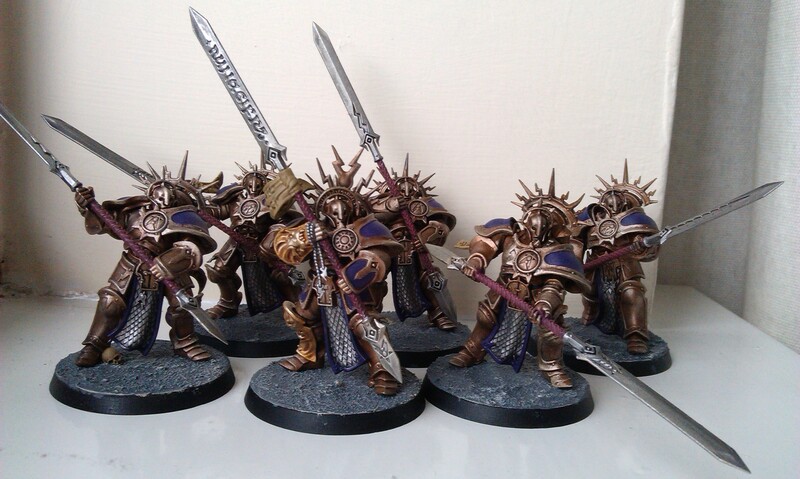 For those of you who didn’t click on the link, I painted six Protectors with Balthasar Gold, and pretty much left it there. It was a promising start, but with an essay due at the end of the month, I hadn’t thought I’d be able to get much done this week to report. Well, I was wrong! Let’s start with the Protectors. 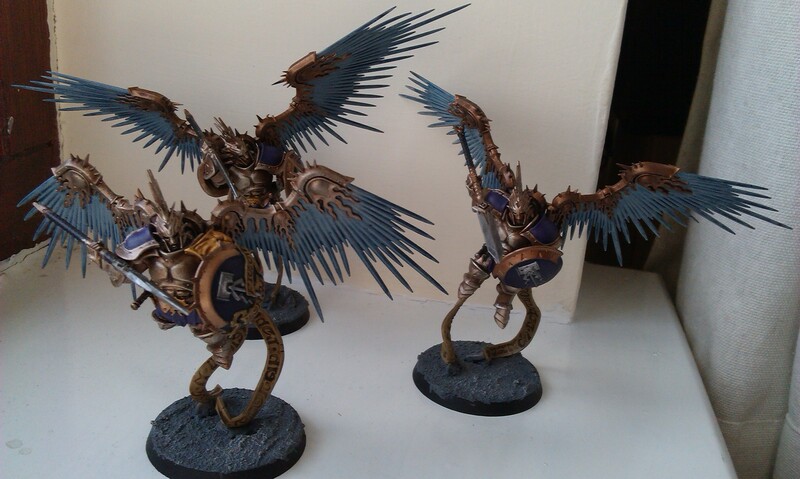 These guys are some of my favourites from the entire Stormcast line released to date. Last week, I’d thought about trying to make them look really ornate and stuff, but decided I didn’t want to make them stand out too much from the other guys I have. The gold armour is the usual thing: Balthasar gold base, washed with Agrax earthshade, then drybrusged with Golden Griffon. For the purple, it’s a basecoat of Naggaroth Night and then a thin, almost-glaze of Xereus purple. I think the official Lions of Sigmar scheme that inspired me initially also calls for Genestealer purple, but I’ve never really wanted to highlight it up that much – I prefer my models to look almost dark, with more realistic highlights provided by the natural light on the model. Anyway! 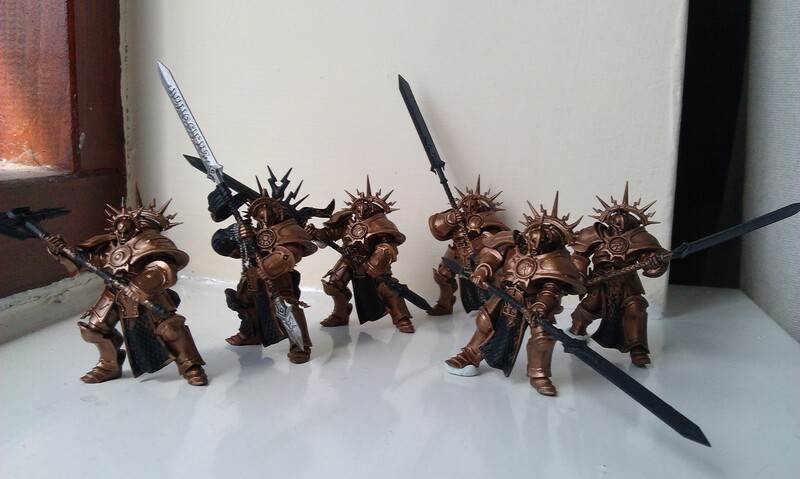 The metal is the usual Leadbelcher/Nuln oil/Runefang steel thing, though I’ve also done a very light drybrush with Liberator gold on the glaives, as I wanted them to appear somewhat special. The haft of their weapons is Screamer pink washed with Agrax earthshade and drybrushed with Pink Horror, and that’s pretty much that! I’ve done four more paladins, as well. The base set for Age of Sigmar comes with three Retributors, but the paladins box has enough for five guys, which has always been a bit of an annoyance for me. I’ve previously built up five Decimators, but when I was building the Protectors, I decided I’d make three units of six for the three paladin types. Hence the six Protectors in the first picture, of course. My prime motivation for doing three more Retributors was my second game of Age of Sigmar, in which my Retributors did extremely well. I also thought the Soulstar Mace was a really powerful weapon, so wanted another one! My Lord Castellant is still one of my favourite models to work with so far! Unfortunately, I think he’s currently at the very limit of my skills with a paint brush, yet I feel there’s still a lot that could be done to him. However, I feel really pleased with the achievement here. Especially considering I painted him fully built! That lantern has turned out so well! Sometimes I’m overly modest about my work, but I feel really proud of what I’ve done, even though I know it won’t be winning any awards or anything. The basic armour and stuff is the same as with the other guys. 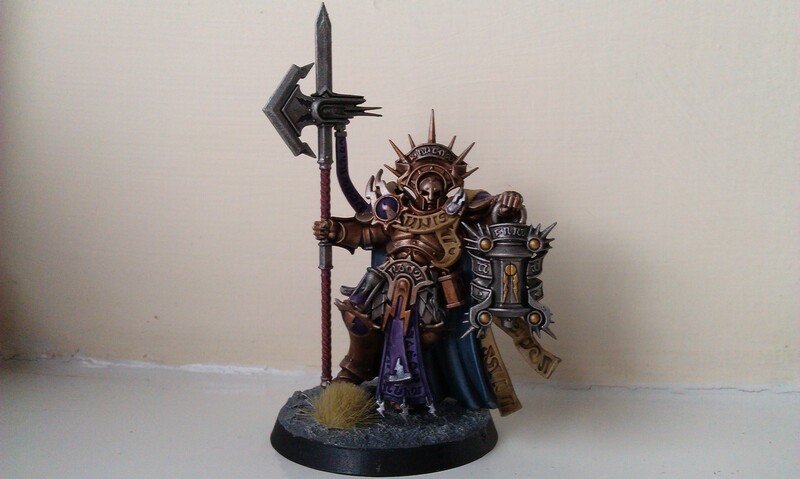 For the tabard and the ribbon that comes off his axe, I painted them Warpfiend grey and washed it Druchii violet, something I’ve previously done with the standing Lord-Celestant. For me, the biggest thing on this guy was his cloak. I just didn’t know what to do with it for days! I’d painted it Celestra grey, but had no idea where to go from there! This morning, however, I took the plunge and washed it with Drakenhof Nightshade. It looks good, and ties in well with the Primes from the various warrior chambers, whose feather crests on their helmets are all done in the same manner. The lantern is basically Leadbelcher, washed in Nuln oil, the lightning bits done in Retributor armour, and then very lightly drybrushed with Runefang steel. I think it’s quite a simple thing that looks really effective now that it’s finished. Really happy with that, in case you can’t tell! 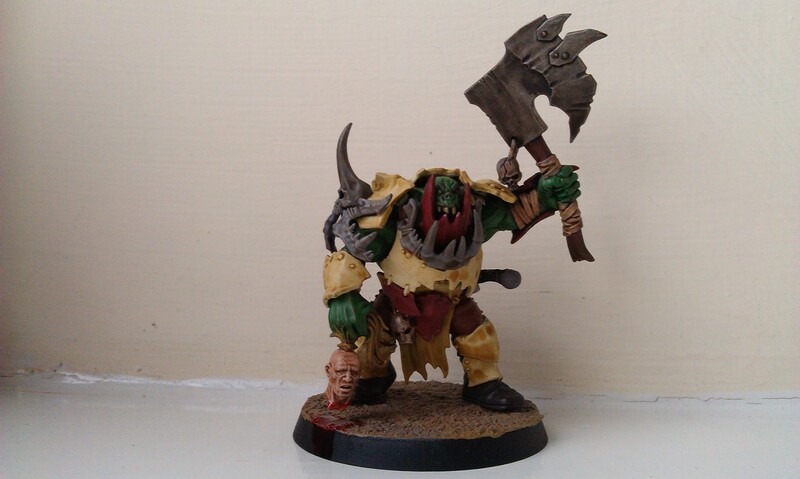 Finally, I think my Orruk chap is completed, too! As with the Lord-Castellant, I think he’s as good as my skill can make him right now, so I’m going to leave him there. 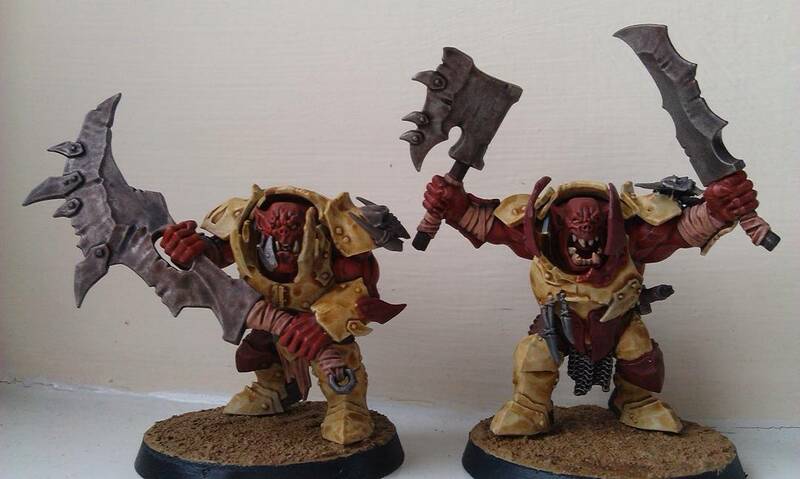 The bone has been done, just Dawnstone with an Agrax earthshade wash, and the wrappings have been painted in Kislev flesh and a mix of Agrax earthshade and Carroburg crimson – basically, I wanted the wraps to actually be strips of flesh torn from his enemies! Something I’m particularly excited about with this model is that I’ve used Blood for the Blood God for the first time ever, pooling beneath the severed head. It’s actually a lot different than I thought it would be, and I’m already thinking I might try it on other models. I’m not really one for making my models look dirty and whatnot, I prefer a clean finish, but it might add to some of the scenery or whatever on the base! Anyway, that’s all the progress for this week! I’m surprised there’s been so much of it, to be honest – particularly seeing as how I’ve also managed to read two books and write a 3000-word essay! I should clearly have time off work more often! Don’t forget to come back next week, for what I hope will be a really exciting update blog! … because I’m painting Stormcast Eternals again! I’d built these gentlemen up in November, and have only now gotten round to doing anything more with them, which is just shocking! 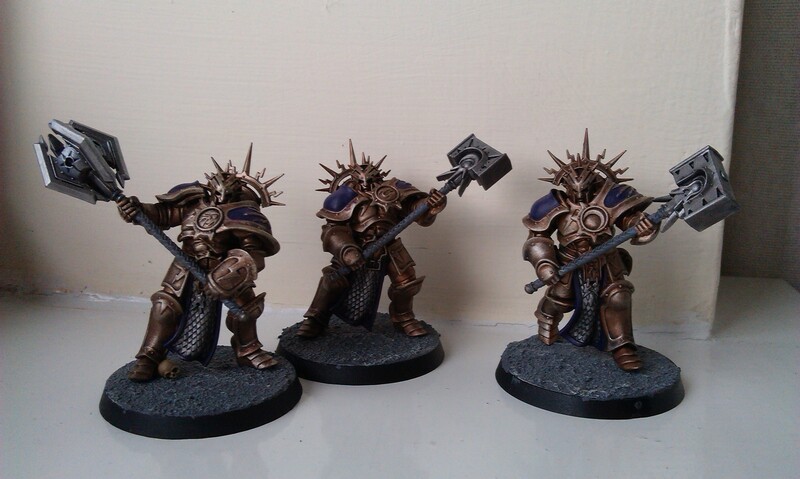 The Protectors are one of my favourites of all the Stormcast Eternals we’ve seen thus far (Prosecutors will always have the top slot for me, but Protectors look really cool as well). 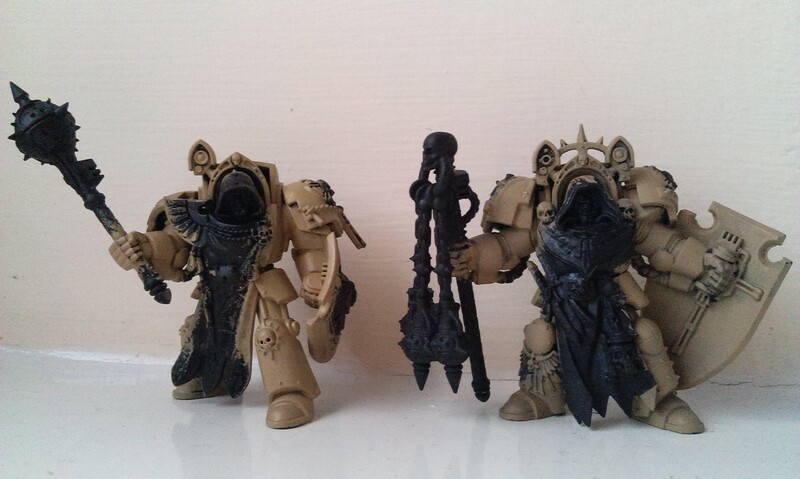 While I was putting the gold basecoat on them this morning, I found myself thinking about a kind of background for these guys within my stormhost, and came up with the idea that they’re like the obsessive weapons pros, who think they’re better than the average Liberator because the glaive is more difficult to wield, especially if they’re using it in defense. I want to make them look somehow perfect, with a lot of silver and purple details on the gold armour, to help promote this image of vanity, I think. And this is something that I love about the hobby – the storytelling! Sure, the miniatures are just bits of plastic that we slap paint on, and the game is a lot of throwing dice around, but the fact that it can be made so much more is of huge appeal to me, and I find that I often start the story when I’m spending all of this time painting the models. Anyhow, that’s about it for the progress I’ve made this week. I’m off work next week, as I have an essay to write for the degree I’m doing; the essay is due the end of May, so I have about two weeks to get it done, but I may not have much to report next week. I guess we’ll see, though, as I do feel like I may have rediscovered some motivation, at least! Author spalanzPosted on May 7, 2016 May 7, 2016 Categories other stuff, WarhammerTags Age of Sigmar, Chester, comics, DC Comics, Games Workshop, Green Lantern, Justice League, New 52, Orruks, Warhammer2 Comments on It’s Saturday! It’s new Sigmar time again! The biggest draw, for me, is this chap. I’m still undecided if I actually want to get the big dragon for the Stormcast Eternals line, which is part of the reason why I didn’t do any kind of feature-blog here as I tend to do when new models get released for pre-order. There’s just something about this model, however, that I really like somehow. 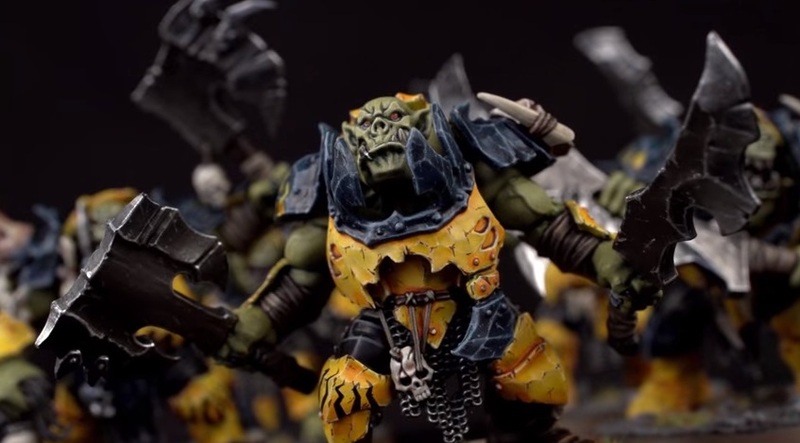 The spoiler pictures have been doing the rounds of the internet for a couple of weeks now, of course, and initially I was wondering if I could adapt it, putting one of my Ogres on top there instead. These spoiler pictures weren’t too great, so I couldn’t really see what the Orruks themselves looked like, but had just assumed I wouldn’t really be all that interested in them. Well I’m actually intrigued now! Part of the reason, I suppose, is just the fact they’re shiny and new, but I do like variety as well, and often think of the Destruction faction more like mercenaries than anything else, so including some alongside my Stormcasts isn’t entirely out of the realms of possibility. I mean, Sigmar is trying to purge the Realms of the taint of Chaos, and Orruks and Ogors just seem to want to fight, so why not? One of the reasons why I like these chaps is their fluff. This week’s White Dwarf has got a lot to say about the new Orruks, obviously, and a lot of it uses that Cockney twang that often looks so annoying, but somehow just fits right in here! It’s one of the things that makes the Warhammer setting so uniquely British, and I love it all the more for it! 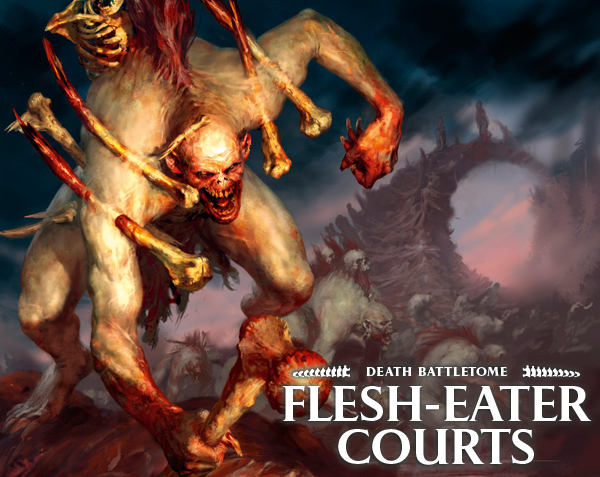 While I’m not always a fan of the big stuff (it is a miniatures game, after all), I plan to pick one of these up next weekend, along with the Battletome, because why the hell not, and possibly another unit of something. Not quite sure yet. But even if they don’t go alongside my Stormcasts, it might be the excuse I need to get moving with my Ogors and get a true Destruction army under way! As for colour schemes, I definitely won’t be going for that eye-damaging yellow look. 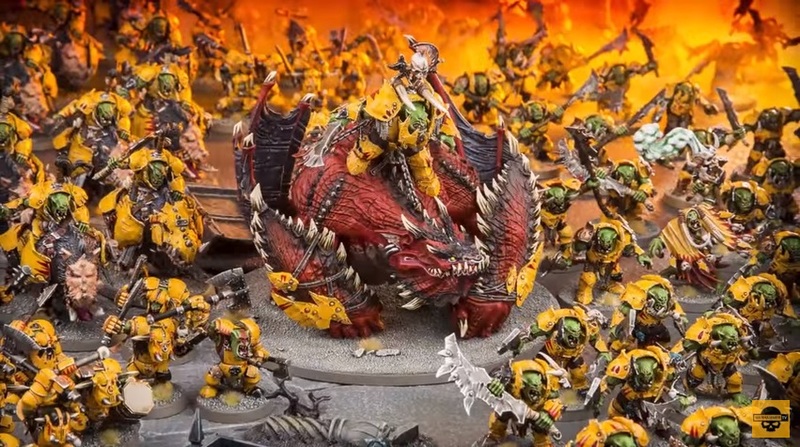 I don’t know if they’re trying to draw a close comparison with the Orks of 40k, whose studio scheme also uses a lot of yellow, but the teaser in this week’s White Dwarf has got me thinking maybe they intend to produce cross-system kits? “Dakka” is more 40k than fantasy, after all, so maybe they’re going to take a route similar to Chaos Demons and have stuff that can be used in both games. But that’s getting off-topic. 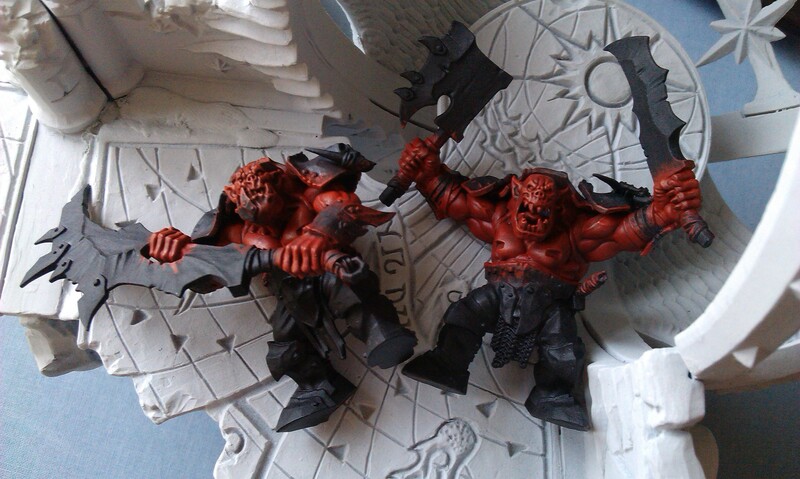 I’m thinking I might go for some kind of red armour, though I’m not the biggest fan of painting red if I’m honest. There’s at least a week to decide, though – and knowing how fast I paint, I’ll probably have a lot longer than that! 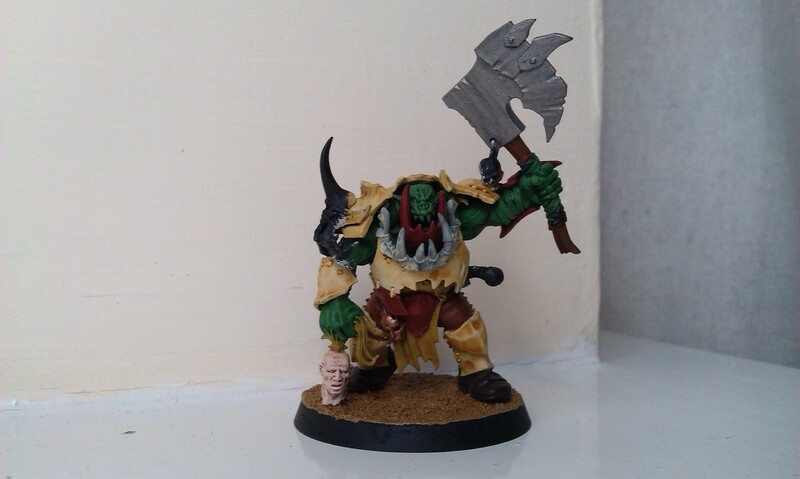 Author spalanzPosted on April 23, 2016 April 23, 2016 Categories WarhammerTags Age of Sigmar, Destruction, Games Workshop, Ironjawz, Orcs, Orruks, WarhammerLeave a comment on Orruks! 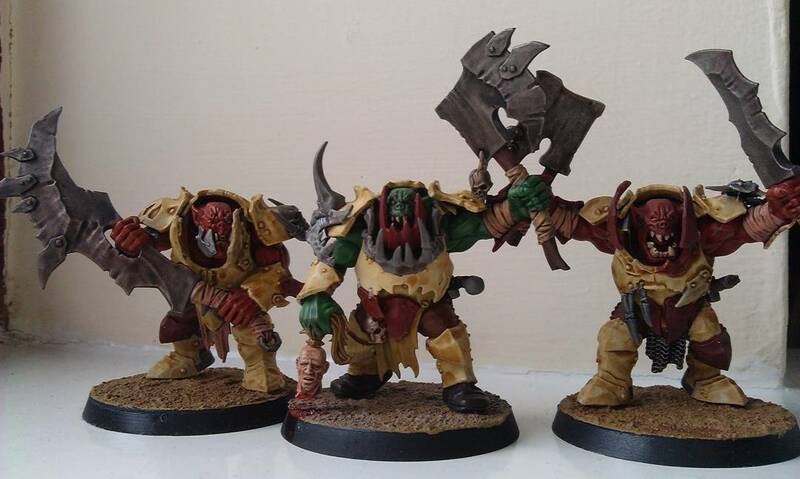 Ironjawz! Oh my!